In the era of numerous choices, from choosing the perfect shape and size to choosing the right frame and fabric, the task of purchasing a sofa can be overwhelming and daunting for you. The sofa is one of the most important investments of your living space for it stays in your house for decades. You might have a picture in your head of exactly what you want but once you walk into a showroom you’re spoilt for choices. It is very crucial for you to buy a Sofa that is durable and comfortable for your family as they are going to spend a good time sitting on them watching Netflix and playing games. Buying a bad one means it could lose its charm, frame and comfort at the drop of a hat in a few months. Let’s remove that “ouch” factor from the couch shopping by guiding you! Save yourself from buyer’s remorse by keeping in mind the following tips. It’s tough to nail down your own personal style, but trust your instincts while choosing the couch that will compliment your house space and is comfortable at the same time. If your room has an eclectic feel to it, choose a sofa that has best of both the worlds, a vintage sofa in a colourful fabric will express your taste. If you’re traditional, a classic neutral structured sofa will amplify the surroundings of your room. Always measure up the dimensions and footprint of the sofa with a measuring tape and make sure the furniture is taking an apt amount of space of your room. A narrow/low/no arm sofa will make your room look larger. Sofa with pointy metal like BREVA stands makes the room look bigger. So carefully choose the size and style! A sturdy, high-quality frame is what great durable sofa is made of. Be wary of particle board and plastic as they may crack. Softwood is low cost but might not last more than 5 years and could make them wobbly, hence, invest in hardwood as it is durable. The frames should be made of high-quality timber and metal. Sofas are one of the most used furniture in the house, it’s important to select the material which is more durable. Cotton and linen are comfortable but they are not always easy to wash and durable. Wool and leather are beautiful but expensive. Fabrics with a dose of synthetic fibre are going to be more durable and give good value for your money. 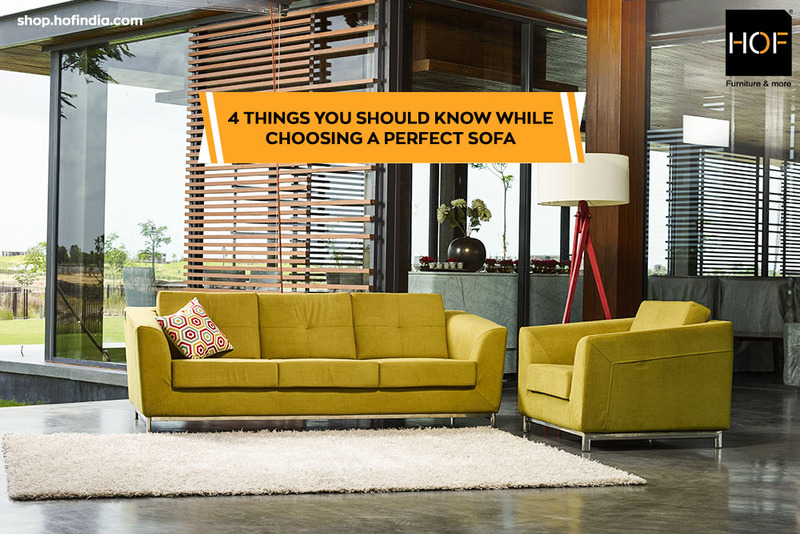 If your family has kids then it’s advisable to go for fabric sofas that are kid-friendly, something that resists tears and rips and is stain resistant. Use semi-aniline finished leather that is durable and easy to clean up when your little ones spill. Choose a fabric which is neutral in colour as it will go with most décor styles. Do not compromise on quality because Sofa is the centre of attraction of your living space, a space where first impression is created. It should be solid, sturdy and strong. If it feels wobbly, light and weak when you sit on it then take a pass, don’t go for it. Comfort can make and break the deal of a sofa if you don’t choose the right cushions. Always go for unattached seat cushions and back cushions, kids in the house will spend a good amount of time jumping on the sofa so it’s perfect having an option to flip and rotate. If you cannot maintain fluff for your cushion, consider a sofa with polyurethane foam cushions, which hold their shape longer. High resilient foam is expensive but more durable and comfortable. Always weigh the practical benefits while buying a Sofa, because it’s the choices that decide the future of your furniture. Always ask yourself “will I like this piece after 5/10 years” and if your heart says Yes! You know you’re on right track. Furniture like Sofas are an investment, so always spend in the best quality you can afford. HOF offers a wide range of sofas, designed in Italy and made in India. If you are in search of a perfect sofa set for your living space then shop.hofindia.com is the best place to visit. « Soft Casters Or Hard Casters: What Is The Difference?